Ask for price - Weight: 550 kg - General very good condition used equipment, ready for use. - Hydraulic hammer in 2004. Ask for price - Weight: 4,750 kg - For 45-70 ton excavators - Hydraulic hammer in 2017. Weight: 540 kg - New equipment, ready for use. - Hydraulic hammer in 2019. Weight: 2,200 kg - New equipment, ready for use. - Hydraulic hammer in 2019. Ask for price - Weight: 3,000 kg - General very good condition used equipment, ready for use. - Hydraulic hammer in 2010. Weight: 1,860 kg - For excavators Caterpillar 315, 316, 318, 319, 320, 321, 324, 329 - Hydraulic hammer in 2017. Weight: 1,700 kg - For 20-30 tons excavators - Working conditions - Hydraulic hammer in 2012. Weight: 3,200 kg - for excavator 30-47 tons - weight 3200 kg - Hydraulic hammer in 2011. Weight: 2,400 kg - For 27-35 tons excavators Oil flow 180-205 liters / minute back pressure 25 bar Unused - Hydraulic hammer in 2018. Ask for price - Weight: 3,200 kg - Functionally - for escavators 30-47 tons - Hydraulic hammer in 2013. Weight: 540 kg - Used equipment ready for use. - Hydraulic hammer in 2019. Weight: 1,050 kg - Used equipment ready for use. - Hydraulic hammer in 2019. Weight: 1,250 kg - Used equipment ready for use. - Hydraulic hammer in 2019. Weight: 1,700 kg - Used equipment ready for use. - Hydraulic hammer in 2019. Weight: 2,200 kg - Used equipment ready for use. - Hydraulic hammer in 2019. Weight: 2,900 kg - Used equipment ready for use. - Hydraulic hammer in 2019. Weight: 3,200 kg - Used equipment ready for use. - Hydraulic hammer in 2019. Weight: 3,700 kg - Used equipment ready for use. - Hydraulic hammer in 2019. Weight: 4,400 kg - Used equipment ready for use. - Hydraulic hammer in 2019. Weight: 5,000 kg - Used equipment ready for use. - Hydraulic hammer in 2019. Weight: 5,800 kg - Used equipment ready for use. - Hydraulic hammer in 2019. Weight: 700 kg - Used equipment ready for use. - Hydraulic hammer in 2019. Weight: 608 kg - for 12-13 ton excavators Copy of Montabert BRH250 - Hydraulic hammer in 2000. Ask for price - Weight: 6,500 kg - General good condition used equipment, ready for use. - Hydraulic hammer in 2002. Ask for price - Weight: 4,200 kg - General good condition used equipment, ready for use. - Hydraulic hammer in 2004. Ask for price - Weight: 1,400 kg - General good condition used equipment, ready for use. - Hydraulic hammer in 2002. Weight: 1,200 kg - Excellent condition used equipment, ready for use. - Hydraulic hammer in 2000. 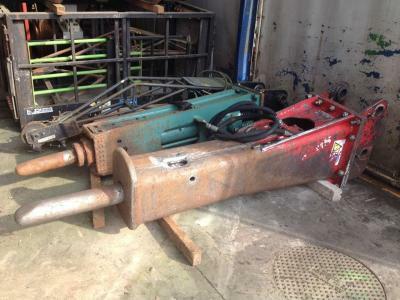 Weight: 1,750 kg - General good condition used equipment, ready for use. - Hydraulic hammer in 1995. Ask for price - Weight: 550 kg - General good condition used equipment, ready for use. - Hydraulic hammer in 2005. Weight: 1,088 kg - For 20-25 ton excavator - Hydraulic hammer in 2004. Ask for price - Weight: 1,100 kg - hammer lines - for excavators 12-25 tons - 860 liters / minute - Hydraulic hammer in 1998. Weight: 1,600 kg - For 16-27 tons excavators Required oil flow 80-140 lit/min Strikes per minute: 300-700 Working pressure 115 BAR Impact energy 2100 joule - Hydraulic hammer in 2000. Weight: 2,250 kg - Perfect conditions For 25-37 ton excavators - Hydraulic hammer in 1994. Ask for price - Weight: 3,480 kg - General very good condition used equipment, ready for use. - Hydraulic hammer in 2007. 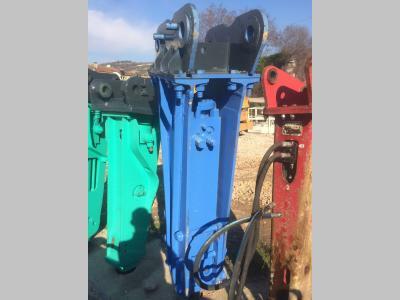 Ask for price - Weight: 1,240 kg - Rammer 2155 hydraulic breaker Used, fully reconditioned (overhauled and repainted) with warranty YOM 2010 Equipped with automatic greasing system Ramlube III, n.1 tool, CE certificate and user manual ...continue. Ask for price - Weight: 3,150 kg - For 35-55 excavators 90ADB5612 and 90ADB05858 - hammer tool - Hydraulic hammer in 2000. Weight: 920 kg - Hydraulic breaker Rotair OLS 950 Ecosilent, year 2011, weight 920 kg, hydraulic system max delivery 110 lt/min, hydraulic system pressure 170 bar, previously installed on tracked excavator Komatsu PC ...continue. Ask for price - Weight: 3,000 kg - General good condition used equipment, ready for use. - Hydraulic hammer in 2006. Ask for price - Weight: 1,850 kg - General good condition used equipment, ready for use. - Hydraulic hammer in 2006. Ask for price - Weight: 560 kg - For Midiexcavators 8-10 ton - Hydraulic hammer in 2017.